Seeking PLUR life at Electric Daisy Carnival 2019 in Las Vegas? Be sure to look for us at at the EDC May 17-19, 2019. PLUR community at festivals like EDC around the country. 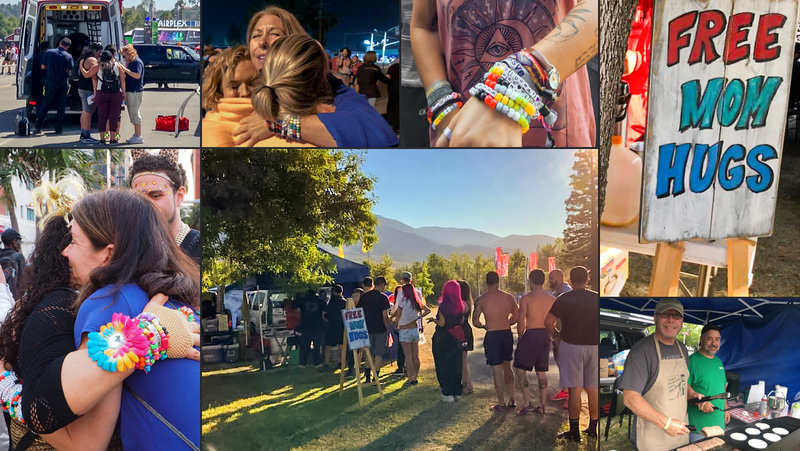 We're rave parents attending festivals around the US helping ravers in need. Need a safe place to hang? Feeling alone or scared? We're here for you! No judgement. As Christians this is our way of SHOWING how much God really cares about you... not shoving religion down your throat. There is an amazing purpose for your life! You are precious and valuable and beautiful... every single one of you! You are seeking PLUR at raves; but not everybody there is. Stay alert and sober. Our rave moms have found many people who have overdone it, unable to protect themselves. We have stood in between them and predators outside some of these venues. Staying sober is your best chance at a rave to stay safe. Drugs are prohibited by the promoters... for good reason. Stay together and watch out for each other. Get your group to decide on a meeting spot in case you get separated. It helps to take a photo or drop a pin so you remember where you parked your car. Never be alone or let your friends be alone... if one of them has to leave, don't let them leave alone! Stay hydrated... Vegas heat is legendary! Never accept an unsealed drink from someone because getting dosed is way too common these days. Rave mom rant is over! It's because we love you. Stop by our PLURWAY area outside the venue at Electric Daisy Fest if we can be of help or encouragement.